It is cozy & relaxing. Small pool & no intercom tho. But still it was one of our memorable stay in Bora & would love to book again soon. Hope we will be given the priority on the Dec. 30th Till Jan 3 for salt villa. The staff was amazing! They were so friendly and accommodating! We appreciated all of the help we got arranging tours and shuttles. Loved that the beautiful beach was right there. And nothing could describe the views! The staff especially Vanessa and Aquilla and Apollo but everyone super friendly helpful fun happy .we totally loved the location and the house pool was good but didnt need as great beach.would totally recommend and return actually we all wanted to move in ! 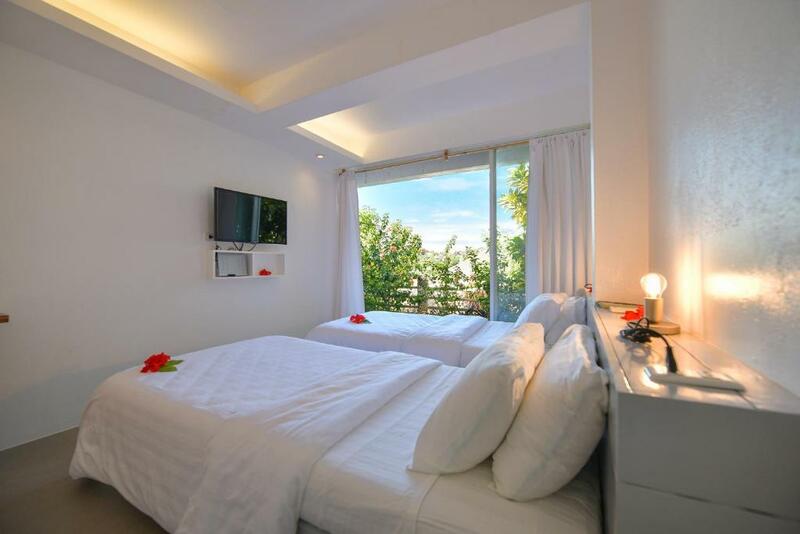 The beds and bedrooms were super comfy, and the decor and view from the villa was gorgeous. Appreciated that we can order food and groceries in as going out was difficult when it rained, especially with kids. We actually just loved lounging in the villa playing card games and taking in the beautiful view, which was good as it rained constantly from a nearby typhoon. С учетом того, что на самом острове пока делать особо нечего после ремонта, советую выбирать именно готовый к приему гостей отель ( которых на данный момент порядка 150). Так вот, этот готов на 100%. Пять минут до пляжа. Все чисто, продумано до мелочей. Вода, чай, кофе и фрукты на вилле включены. Отличный вид из бассейна, до сити Молла 10 минут ходьбы. До белого пляжа 15. Однозначно советую. l'accueil de vanessa et du personnel . piscine extra . jardin et vue sur la mer extra. Lock in a great price for Diniview Villa Resort – rated 8.6 by recent guests! 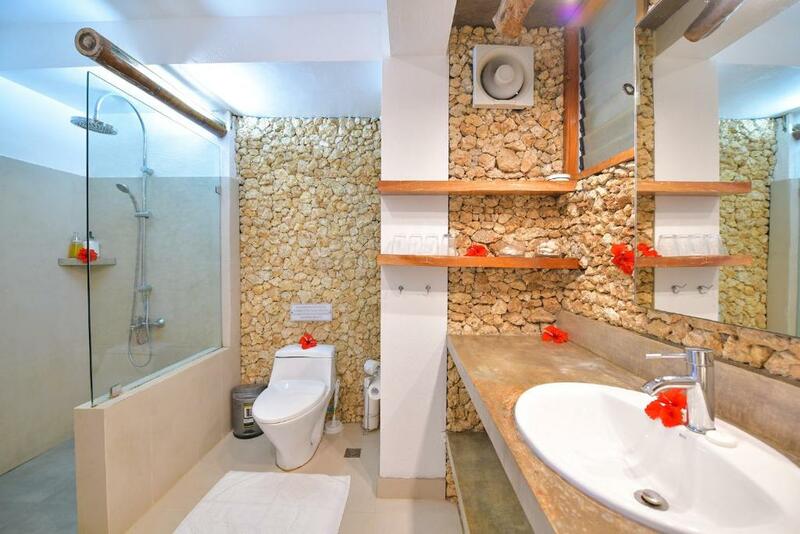 Diniview Villa Resort This rating is a reflection of how the property compares to the industry standard when it comes to price, facilities and services available. It's based on a self-evaluation by the property. Use this rating to help choose your stay! 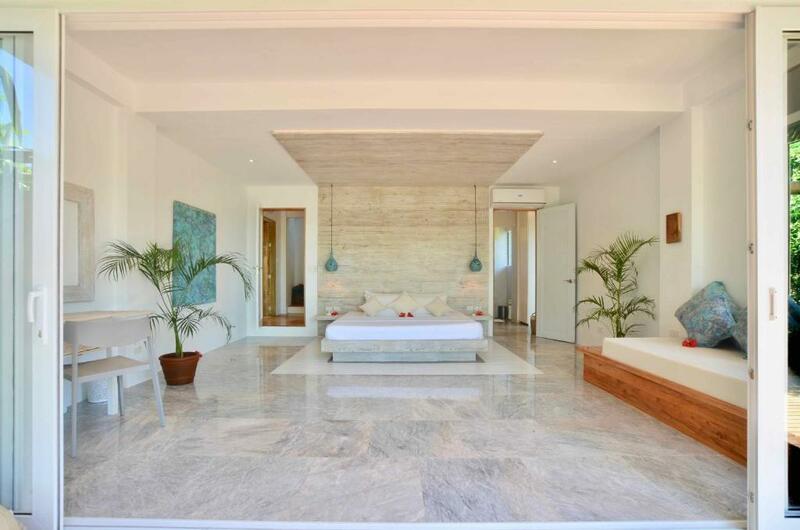 Diniview Villa Resort features spacious and 2-story villas with free WiFi, a balcony offering ocean views and kitchen facilities on Boracay. The property has an outdoor pool with sun loungers and provides beach access via a flight of stairs. 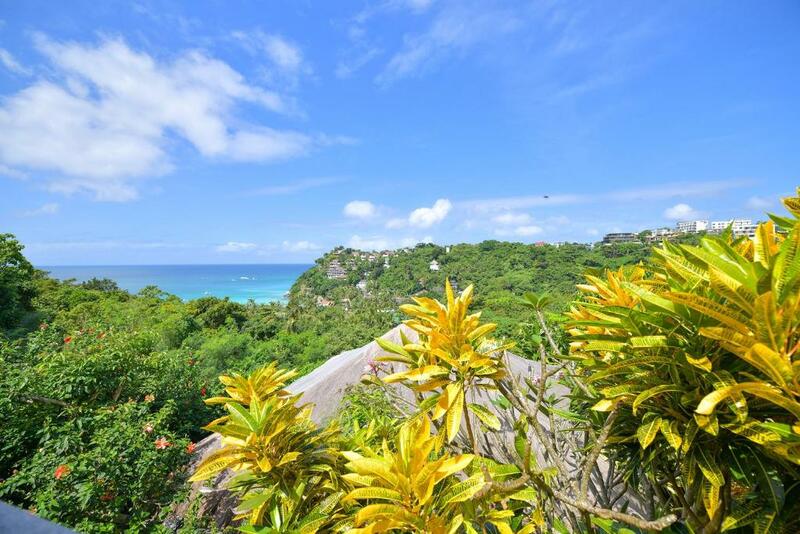 Diniview Villa Resort is 650 feet away while Willy's Rock is 1.2 mi from Diniview Villas. Each villa offers air-conditioned bedrooms, a large living room and veranda with a view. The kitchen comes with a stove, oven, electric kettle, refrigerator and coffee machine. The friendly staff will provide guests with a beach basket with beach towels for convenience. Airport shuttle services can be arranged at a surcharge and fresh groceries can be delivered to your room upon request. When would you like to stay at Diniview Villa Resort? Featuring an outdoor shower, mosquito net and a veranda with a view, this 2-story villa has dining and living areas and a kitchen upstairs and 3-air-conditioned bedrooms downstairs. Featuring an iPod dock and mosquito net, this two-story villa has a kitchen, indoor/outdoor dining and living areas and veranda downstairs. 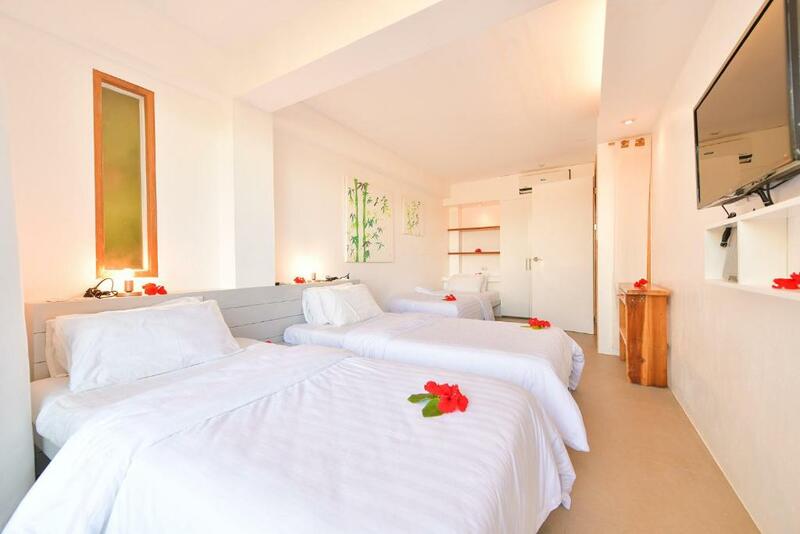 Consists of 1 air-conditioned bedroom downstairs and 2 air-conditioned bedrooms upstairs offering beach views. This coming October, Salt Villa will be upgraded to a 4 bedroom villa for 8 people with an infinity pool. The basic layout and comforts of the villa will still remain, but an additional room will be added downstairs. An infinity pool will be located in front of the wooden veranda overlooking the famous white beach view. New photos will be added once the improvements are completed. The new villa rates apply starting November 2017. 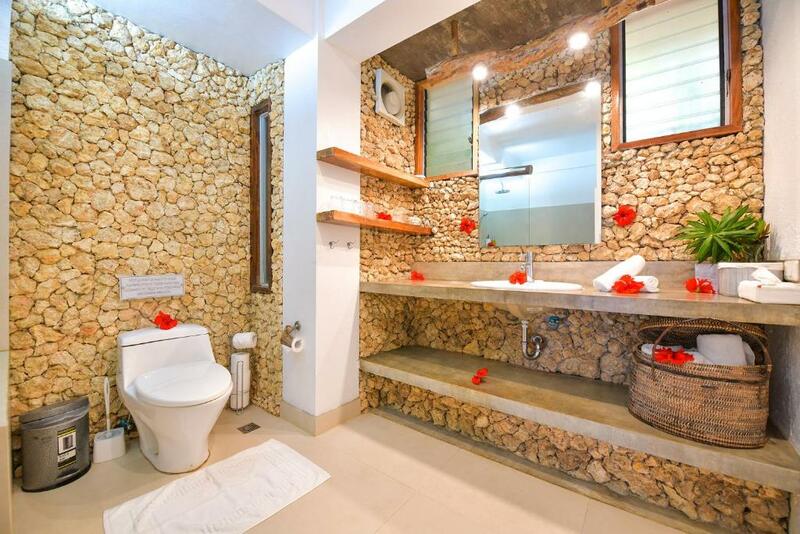 This two-story villa is located uphill and features a small garden in the toilet, veranda, kitchen, dining and living areas upstairs and 2 air-conditioned bedrooms downstairs. This two-story villa has a large living room, kitchen, dining area and veranda with a view upstairs and 2 air-conditioned bedrooms downstairs. This two-story villa features 2 air-conditioned bedrooms upstairs and a kitchen, large living room and veranda with a view downstairs. Mosquito nets are included. 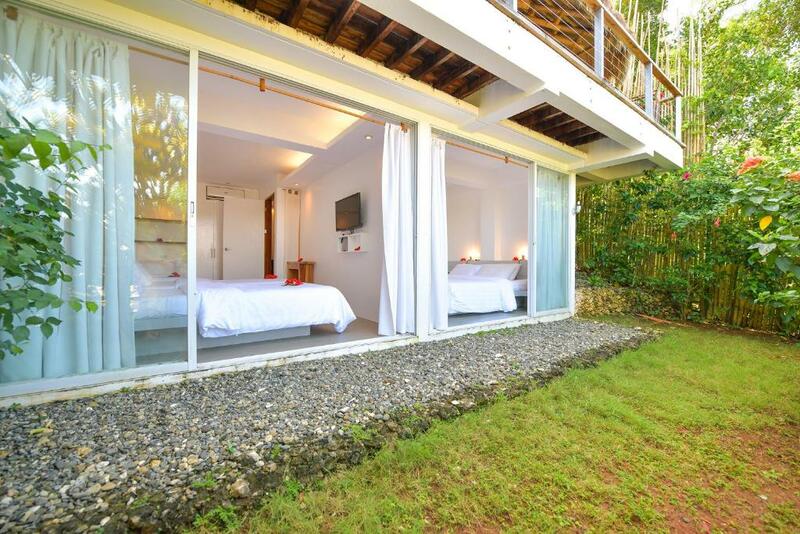 This villa features a balcony, kitchenette and mini-bar. This villa has a balcony, air conditioning and private entrance. 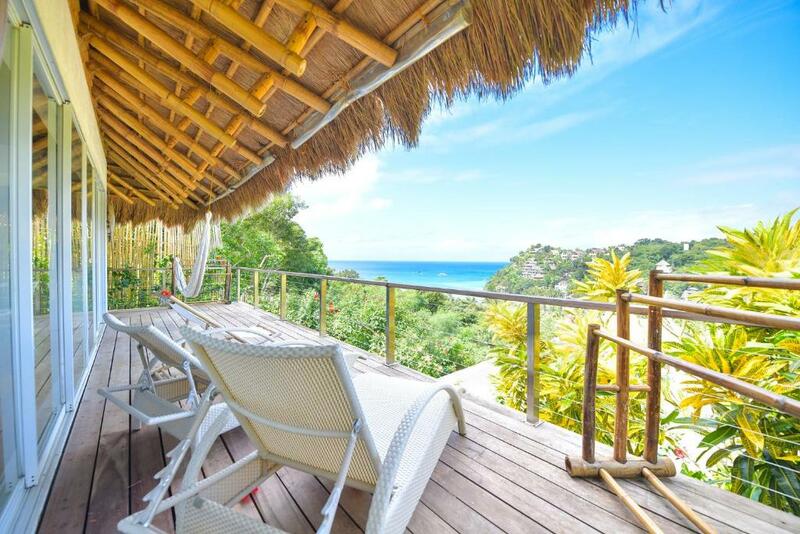 DINIVIEW Villa Resort is located on the hillside between Diniwid Beach and White Beach, with a perfect view of the spectacular Boracay sunset. If you're looking for your own private paradise away from the crowds, this location is perfect for you. The Villas are situated in splendid isolation surrounded by foliage, all with beautiful ocean views. In the center of the resort we have a swimming pool and sundeck. Take the stairs down from the Villas along our little path and you're on Diniwid beach in less than five minutes. Once on the beach it is a ten minute walk to the next cove which is the world famous White Beach, with all it has to offer, including, water sports, shops, spa's, restaurants and night life. But don't underestimate the very quaint DINIVIEW Beach as it has its own charms including locally run restaurants and spots to relax and spend the day. Diniwid Beach has become the unofficial second living room of DINIVIEW Villa's. The sand, sea, and wind is what inspires us and we hope you find a home away from home at DINIVIEW Villa Resort. The island offers a wide range of activities, and our personal favourites besides walking the beaches and eating great food, are paraw sailing, spa treatments, yoga, golf, diving and kite boarding. Sailing: As you're on an island, take the chance and rent one of the local paraw sail boats and do a tour around the island. You will discover small cute coves, snorkelling areas and different beaches riding with the wind and the waves. We believe it’s one of the better ways to see the island. Spa and massages: For a great holiday, unwind with a good massage or a spa treatment. Yoga: You can find a wide range of very good Yoga classes, from True Yoga, daily classes at 9 am, to Mandalas yoga retreats, to private sessions with a wide range of international Yogis. Golf: Boracay has a fantastic 18-hole golf Corse that holds world class standards. Diving. Diving is an old island activity, and where better to do than in the tropics with crystal clear waters and coral reefs. Boracay island has a few dive sites of different variety’s, from deep sea with bigger fish to shallow coral gardens. Kite Surfing and wind surfing. Restaurants and dining. Diniwid beach is located north of white beach. It's a small cove surrounded by coral limestone rocks. A cliff trail leads you directly to White Beach. The little cove has a nice private beach and doesn’t get as crowded as White Beach. A few smaller resorts are located on the hills around the cove and at the beach there are a few small restaurants. Diniwid beach has a cosy private feel and small uniqe hotels, restaurant and bars. It is the perfect spot to watch sunset. The Boracay main road also goes to Diniwid Beach and you may ride a local tricycle to and from. House Rules Diniview Villa Resort takes special requests – add in the next step! Diniview Villa Resort accepts these cards and reserves the right to temporarily hold an amount prior to arrival. Please note that the property will contact guests directly to provide the credit card authorization form. Guests are required to return the completed form with a copy of the front and back of the credit card. The only minor negative was the cleanliness. We did find some bat droppings here and there in our villa, but it wasn't a huge issue. In addition, there was some mold on the A/C unit and the floor didn't seem to get cleaned. To be clear, though, nothing was dirty; just minorly uncleaned. The view is one of the primary reasons to stay at Diniview. As the name implies, we had a spectacular view of Diniwid Beach from our 2nd floor terrace. Waking up to such beauty made me feel like royalty. In addition, the hotel staff are very friendly and helpful while they also respect your privacy. Vanessa and Gabriel made our stay very comfortable! The complimentary breakfast and eggs and fruit lasted us our 4 day stay (granted we also shopped for our own food), and it was all tasty. The drinks they stock in their "minibar" were also very reasonably priced, so that made things better as we didn't have to lug bottles of beer from the stores to our room. The location was exactly what my girlfriend and I wanted: secluded and quiet. Diniview is in the Yapak part of the island, so it's very north, away from the crowds of Stations 1-3. Despite this, the Diniwid Beach is only about a 5 minute walk down a great little pathway, and White Beach is another 10 minute walk from there. We spent a lot of our time just walking from our room down to Stations 1 or 2, and that took about 30-40 minutes. Sounds like a long time, but it didn't feel like it, as the scenery and the inviting beach made the trip very enjoyable. Haha! Be prepared for stairs ... but oh so worth it! Not replenishing the shower cream. Transport not available to the villa. Aircon in the living area may have been good to have if needed as mosquitoes come in at sunset with doors open. The wood lice that came out at night in the downstairs bathroom were a nuisance, but probably not much they can do about that given the villas are situated in the middle of a tropical rainforest. It's quite a steep walk down to Diniwid Beach using the beach path steps, which will probably be very challenging for the unfit, and the very young and elderly. The staffs are very friendly, helpful, and accommodating. Everything went smoothly and very well organized from the reservations, to our arrival and departure. It was a stress-free vacation indeed! Relaxing and very peaceful surroundings that is so far away from the crowds. Quiet and quaint Diniwid beach is just a 10-minute walk in the midst of beautiful lush garden. We also loved the variety of breads delivered from Lemoni cafe, the complimentary fruits basket, as well as the coffee, milk, jam, and butter they provided for us on our arrival. Grocery shopping was no sweat, just give your list to them and they do it for a minimal fee. The one I cherished the most is their fully equipped kitchen and the deck where we had our breakfasts that has a breathtaking view of the sea. To top it all off, they even allowed us to linger in our room even we're already checked out as we were waiting for our shuttle to arrive for our departure. Thank you to the owner Ms Julia and Ms Kay. It was such a lovely experience. We will definitely come back. The location was a challenge... very remote, difficult to get around (to the beach, to town, etc). Since the villas were on the top of a windy road there was only one type of taxi you could take. Also, the villas felt dirty and the walls were incredibly thin. You could hear everything.. from the sound of the bugs to your neighbors conversation. Additionally there was only AC in the bedroom.. with hot weather it mean you were basically stuck in there.